@Gas is a member of Techware’s family of software packages bringing accurate thermodynamic properties of fluids to many popular Windows programs. The gas property functions can be used directly from within applications including Microsoft Excel, 1-2-3 and MathCad. Add-ins attach the functions so that you can use them as if they were built in to the applications. This version supports 32-bit and 64-bit applications. New 64-bit components include the gas function library (DLL), the Excel Add-in and DeskTop Air. The package also includes 32-bit versions of these components plus the add-ins for 1-2-3 and MathCad. @Gas provides thermodynamic properties and transport properties of flue gases and moist air. The @Gas package includes: DeskTop Gas, an advanced interactive gas properties calculator; a dynamic link library (DLL) of gas property functions; and various add-ins which link the functions to Windows applications. The add-ins allow you to use the functions as if they were built-in to Microsoft Excel, Lotus 1-2-3 for Windows and MathSoft Mathcad. @Gas accounts for the following gases; nitrogen (N2), oxygen (O2), argon (Ar), carbon dioxide (CO2), and water vapor (H2O). These gases account for 99.997% of the volumetric composition of standard air and also account for better than 99.9% of most combustion gases. The thermodynamic functions are calculated for mixtures of all five gases using an accurate third order virial equation of state. The general form of the equation of state and the derived thermodynamic properties can be found in many publications dealing with gas properties. The specific form of the equations, the data correlation and the computational methodology have been developed by Techware. The functions have been tested against published data and show excellent agreement. A description of the theoretical basis and accuracy is included with the package. All types of calculations involving flue gas are greatly simplified with the @Gas functions. The functions are extremely useful in predicting the performance of waste heat boilers, fossil fuel fired steam generators, heat exchangers, air compressors and gas turbines. You can design equipment right on your favorite spreadsheet without having to look up thermodynamic properties from tables or charts. @Gas is going to change the way you solve many problems involving moist air and flue gases! Your results will be more accurate because you won’t have to read data from charts or interpolate from tables, and you won’t have to make perfect gas assumptions. Added 64-bit version of Gas property DLL. Added 64-bit version of DeskTop Gas. Removed @Gas Help link from all versions of Excel and 1-2-3 menus. @Gas 3.2 is available as a free upgrade to licensed users of @Gas 3.0. Extends the temperature range upwards from 1300 °K,(1880 °F) to 2000 °K, (3140 °F) and downwards from 273.16 °K,(32.018 °F) to 180 °K, (-135.67 °F). GasPTWM, which calculates dynamic viscosity given pressure, temperature and humidity ratio. GasPTWK, which calculates thermal conductivity given pressure, temperature and humidity ratio. Includes DeskTop Gas, an advanced gas property calculator with many improved features over the previous gas property calculator. Adds new unit sets including, EngG using psig for pressure instead of psia, SIF, which uses the formal SI units, MPa for pressure instead of bar and °K for temperature, instead of °C, SIK using kPa instead of bar for pressure, MET using the calorie instead of the joule for energy and METF using kg/cm2 for pressure instead of bar. Dropped support for Quattro Pro and 16-bit applications. Seamlessly extends your spreadsheet program's set of built-in functions. Uses English, SI and metric unit sets. Allows pressures up to 50 bar (725 psia) and temperatures from 180 °K (-135.67 °F) to 2000 °K (3140 °F). Calculates specific volume, enthalpy, entropy, specific heat, viscosity and thermal conductivity. Calculates humidity ratio, molecular weight, amount of condensation and dew point. No programming is required to use the @Gas functions with any of these applications. Just follow a few simple steps to load the add-in, and from then on, the functions will be available every time you start the application. You use the functions just like any of the built-in functions. The functions can be used in any spreadsheet formula and any argument to the functions can be a number, a formula or a cell reference. All of the gas property functions are contained in a Windows Dynamic Link Library (DLL). The @Gas package includes a 32-bit version of the DLL which supports applications designed for Windows 95, 98, NT, 2000 and XP. Function prototypes and LIB files are included in the package to support Microsoft C/C++ compilers. Declaration files are included to facilitate programming with Microsoft Visual Basic or Microsoft Access. The unit set argument selects one of the basis unit sets, selects composition based on either mole fractions or mass fractions, selects water vapor input as either fraction of mixture or humidity ratio, selects reference point for enthalpy and entropy as either absolute zero or same as ASHRAE conditions for dry air, and selects output value as either per mass wet gas or per mass dry gas. The @Gas package includes DeskTop Gas, a handy interactive gas property calculator which runs in its own window. The calculator image below illustrates some of its features including flexible unit selection and an intuitive, standard Windows user interface. 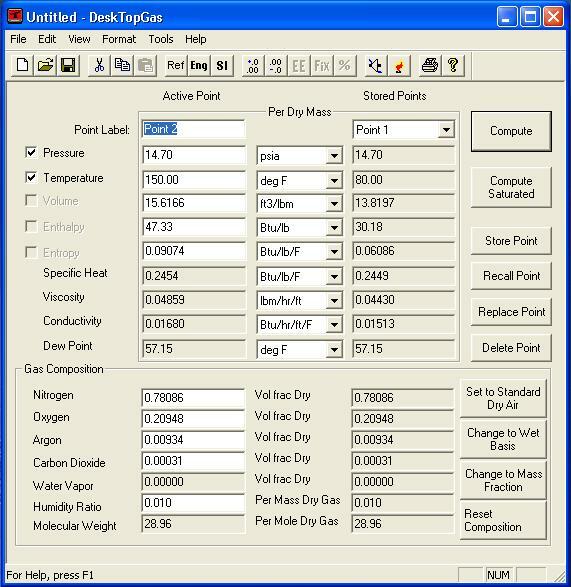 DeskTop Gas is an ideal replacement for your gas tables and it calculates the properties at the exact point you desire so there is no need for interpolation. More importantly, results from @Gas are more accurate than looking up gas properties in tables because the model used for @Gas takes into consideration the effects of compressibility and mixing.